Metal Injection is hosting a premiere of “Lockdown,” the new single by Swedish grindcore kingpins AXIS OF DESPAIR. The band – formed by current and former members of Nasum, Coldworker, Infanticide, Volturyon, Livet Som Insats, Nervgift, Overtorture, and more – is preparing for their Contempt For Man debut full-length to see release through Southern Lord at the end of July. Contempt For Man dispatches twenty super-charged tracks of AXIS OF DESPAIR’s brutalizing but hook-laden grindcore attack. The album surges with blasting percussion delivered with savage force, yet every hit finding its target with pinpoint accuracy. The blazing riffs leave charred scars in their path, while lyrically the band unloads their noncompliance with humanity’s declining ways. Experience AXIS OF DESPAIR’s “Lockdown” at Metal Injection RIGHT HERE. Contempt For Man was recorded by drummer Anders Jakobson at Soundlab Studios and in the band’s rehearsal room Summer 2017, mixed at Studio Ülgnor by Johan Berglund, and is completed with artwork by Paul Romano (Mastodon, Circle, Hate Eternal). Southern Lord will release Contempt For Man on LP, CD, and digital formats July 27th; find preorders at the label webshop HERE and at Bandcamp where the tracks “A Life Of Ceaseless Grind,” “Crush The Empire,” and “The Wolven Law” are streaming HERE. 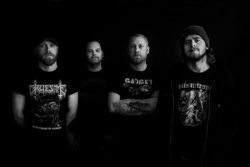 AXIS OF DESPAIR was formed in late 2013 by former Coldworker members Joel Fornbrant (vocals), Oskar Pålsson (bass), and Anders Jakobson (drums). The lineup was completed by guitarist Kristofer Jankarls (also in Livet Som Insats) a few months later and the quartet focused on songwriting. The first recording took place in the spring of 2015 and the twelve tracks were released on the two 7″ EPs — Time And Again, released via Selfmadegod Records, and Mankind Crawls, a co-release through Give Praise Records and Spela Snabbare Records. Following both EPs and several live shows, AXIS OF DESPAIR set to work on new material, striving to create a striking grindcore album with an aggressive, yet diverse selection of strong songs. The writing process was spread out over a year until the band went into the studio and begun the recordings in the summer of 2017, now set to arrive in the form of their debut album, Contempt For Man. For review copies of Contempt For Man and coverage of AXIS OF DESPAIR in The Americas contact dave@earsplitcompound.com, all others contact lauren@rarelyunable.com.